1. Which country have the absolute and comparative advantage in the production of each good? 2. Determine the equilibrium production/consumption in autarky. 3. Let open the two countries to free trade. What is the pattern of specialization? What is the free-trade relative price? 4. Quantify the benefits of free trade in terms of the variation in collective utility before and after free trade, i.e. the welfare variation. 5. Suppose that in Honduras a group of management engineers improve the production technology in both sectors, allowing to produce 1kg of coconut and 1mt of textile with 3 and 6 units of labor respectively. What happens to the pattern of specialization? And to welfare? Discuss. where aij denotes the unit labor requirement for the production of good j in country i. 2 , UHaut = 143.76. Figure 2: Free-trade equilibrium: relative demand and relative supply. sub. C = 100− T.
Figure 3: Free-trade equilibrium: production-possibility vs. consumption-possibility. Notice that Honduras suffers a negative shock in the terms of trade, i.e. Pexport/Pimport. Yet, welfare is still higher in free-trade than in autarky (which is always true) and than in the previous free-trade situation (which is not always true!). Figure 4: Free-trade equilibrium: relative demand and relative supply. 1. Determine the equilibrium production and the relative price of food in autarky. 2. Let open the two countries to free trade. What is the pattern of specialization? Determine consumption and production in free trade, as well as the free-trade relative price of food. 3. Suppose that, in country A, the production technology in the vodka sector improves until is equal to that in country C. What happens to the pattern of specialization? And to the relative price of cheese? V C = 16/5 . V Ccons = 16/5 . Notice that country B enjoys the same level of consumption as in autarky; indeed, the relative price didn’t changed when moving to free trade. 3. After the technological improvement, country A becomes effectively identical to country C. The world relative supply does change: nobody produces food anymore at price 1/5 and the full specialization point moves to FA+B+C/V A+B+C = 2/7. The resulting free-trade equilibrium relative price is (PF /PV )ft′ = 2, at total relative quantity F/V = 3/4. Figure 6: Free-trade equilibrium: relative demand and relative supply. 1. Is there any country holding an absolute advantage in the production of both goods? And who has the comparative advantage in the production of machines? 2. Find the autarky equilibrium in both countries: production, consumption, and the autarky relative price of machines. 3. Find the free trade equilibrium: production and consumption, in both countries, and the world relative price of machines. 4. From now on, assume that wages are given: w = 5 in Nato and w = 2 in Asia. Then, introduce another tradable good, services (S), whose production requires 3 and 15 units of labor in NATO and ASIA respectively. Moreover, assume that all the labor endowment in both countries is still employed in the production of the other two goods, F and M, and there is perfect competition in the factor (labor) market. In which country services are going to be produced? 1. NATO has an absolute advantage on both goods, while ASIA has a comparative advantage in the pro- duction of machines. Use the resource constraints, 200 = 4F + 8M and 480 = 16F + 12M for NATO and ASIA respectively, to obtain the equilibrium quantities: FN = 30,MN = 10 and FA = 18,MA = 16. The equilibrium price is the ratio of unit labor requirements: PM/PF = 2 in NATO and PM/PF = 3/4 in ASIA. 1. Determine the equilibrium production and commercial specialization in free trade, for both countries. 2. Graphically depict the relationship between the relative labor supply and the relative wage. If, for instance, labor supply in Beta increases, what happens to specialization? And to the relative wage? 3. Introduce transportation costs that are 50% of the production costs. What happens to trade flows? What is the maximum level of transportation costs that still allows trade between the two countries? where “−i” denotes the country that is not i. Therefore, country α produces both M and T , while country β produces V .
2. The equilibrium relative wage depends on the supply and demand of labor. We can plot them in the diagram L/L∗ vs. w/w∗, where “∗” denotes the foreign country, which is β. The relative supply of labor is a vertical line, which is given. The relative demand of labor can be formally derived from the demand of goods (but we do not do it! ); in general, it is a downward sloping relationship, as increasing the relative wage can only be consistent with a diminishing relative labor supply (so that the home country becomes more specialized and its wage rises). Therefore, increasing the labor supply of β shifts the relative labor supply (L/L∗) to the left and increases the relative wage (w/w∗). αaαV ⇒ t∗V = 50%. 1. Find the equilibrium relative price of X and production levels in autarky. 2. Suppose that the international relative price of X is 3. Find the equilibrium levels of production and consumption in a free-trade environment. Find also the change in welfare. The MRSX,Y is the marginal rate of substitution, which comes from the utility function and is defined as the ratio between the marginal utility of good X and the marginal utility of good Y . The MRTX,Y is instead the marginal rate of transformation, which comes from the production-possibility frontier (or also transformation curve) and is defined as the marginal opportunity costs of good X in terms of good Y . In equilibrium, they must be equal. Furthermore, in autarky, they are also equal to the equilibrium autarky relative price PX/PY , which can be obtained by evaluating the MRSX,Y (or MRTX,Y ) at the equilibrium quantities; that is, PX/PY = 3/2. 1. Determine the equilibrium production and the relative price of bread in autarky in α. 2. Suppose that bread production is intensive in labor, while trucks production is intensive in capital. Also, suppose that α is relatively more endowed with labor than β. Can the international relative price of bread be equal to 2 when the two countries engage in free trade? What would be the equilibrium production in α, given that relative price? And equilibrium consumption? 3. In α, capitalists are opposing free trade policies and are asking for duties on imports. Are they acting in their own interest, rightfully? And what about the interest of the whole country? with an equilibrium price of PB/PT = 14/9. This is obtained by imposing the equilibrium solution into MRSB,T = T/B. 3. Capitalists would oppose free-trade, rightfully so. See Stolper-Samuleson’s theorem. In a perfectly competitive market with a perfectly inelastic supply curve the state introduces a specific tax on consumers i.e. a tax on each unit of the good purchased. In this environment the effective burden of the tax falls entirely on producers and not on consumers. Solution. True. The price paid by the consumers (inclusive of tax) after the introduction of the tax coincides with the price paid before the tax. Differently, the net price perceived by the producers decreases by an amount equal to the tax with respect to the price before the introduction of the tax. The quantity of the good exchanged is not affected though. 1.8 Commercial Policies The demand for hotel rooms in Mallorca is given by YD = 10−p (where p denotes the price of a hotel room). The supply of hotel rooms is given by YS = p.
1. Determine the equilibrium price and sales for this market both graphically and analytically. Label your graph carefully. 2. Mallorca’s prime minister plans to introduce a specific tax t = 2 on each hotel room on each unit produced (i.e. a tax on producers). Determine the new (after tax) equilibrium quantity. How much will consumers have to pay for a hotel room after the introduction of the tax? What will be the price received by producers for each unit supplied? 3. Calculate the tax revenue of the government. 4. Calculate the deadweight loss generated by the tax. p = 10− p ⇒ p∗ = 5, Y ∗ = 5.
where the prices are: pD = 6 and pS = 4. The gap between the two is exactly the tax. Figure 7: Market equilibrium for hotel rooms. GS = t · Y ∗∗ = 2 · 4 = 8. 1. Derive the schedules of import demand and export supply of bananas (from the excess demand and excess supply schedules) and the equilibrium price and quantity that occurs in the world market. 2. Suppose that Home country introduces an ad valorem duty of 50% on imports of bananas. Show graphically and analytically the new equilibrium in the world market. Figure 8: Market equilibrium: Home, Foreign, and World. (a) What will be Home’s tax revenue from this maneuvre? (b) How does total surplus change? 3. Suppose instead that Foreign country helps its exporters with a subsidy of 1$ for any exported banana. Show graphically and analytically the effects of such policy. with an associated traded quantity of QW = 20. See figure 8. PW,Ht = (1 + t)P W,F t .
GSt = t · PW,Ft ·QWt = 0.5 · 1.2 · 8 = 4.8.
for a total surplus of TSt = CSt + PSt + GSt = 325.6. Thus, Home country does benefit from the duty: the gain in government revenus is enough to offset the deadweight losses. In general, the effect on welfare of a duty is ambiguous when trading countries are of similar sizes, i.e. any country can affect world prices: who gains and who loses depends on the price elasticities of imports and exports schedules. 1. Determine the free trade equilibrium e the change in welfare with respect to autarky. 2. Suppose that Sri Lanka introduces a duty on imports of 5$ per unit. 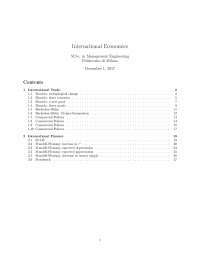 Determine the effects on interna- tional trade. 3. To improve the international competitiveness of its cocoa beans producers, the Sri Lankan government is evaluating the following policies: (i) to introduce a subsidy on production of 5$ per unit, or (ii) to introduce a subsidy on exports of 5$ per unit. Which of the two policies will be more effective in increasing exports? And which one would be preferred by Sri Lankan consumers? 1. In autarky, P = 14 and Q = 260. In free trade, given PW = 12, Sri Lanka imports cocoa beans: IMP = 50. The increase in welfare is the area of the triangle that represents the difference between the increase in consumers’ surplus and the decrease in producers’ surplus: ∆TS = 0.5 (50 · 2) = 50. 2. The duty increases the domestic import price to P = 17. But, at this price, consumers would buy from domestic producers only, who guarantee the autarky price. Therefore, this duty is prohibitive, since it shuts down international trade. becomes again a net exporter, with EXP ii = 25. The government surplus is GSii = −s ·Sii = −1525$, since all the producers are exporting. That is, the policies (i) and (ii) are in practice identical. 1. Find the equilibrium of the economy, i.e. the couple E ≡ (i, Y ), and represent it in the IS-LM diagram. 2. Give an example of a couple (i, Y ) that is characterized by excess demand for money and by excess supply of goods. Describe the adjustment mechanism towards the equilibrium. 3. Starting from the equilibrium E derived in point (1), suppose that the government increases public expenditures by ∆G = 30. Find the new equilibrium E′, providing a graphical illustration and a brief written description of the process. 4. Consider instead an increase in (real) money supply: what happens to equilibrium E? which in fact is a vertical curve, since we are assuming that any of the components of aggregate demand does not depend on the interest rate.
) = (120, 1000) . 2. Any point above (or to the right of) the IS curve is characterized by excess supply of goods, since we need to decrease the interest rate or to decrease income to obtain the equilibrium in the goods market1. Similarly, any point above (or to the left of) the LM curve is characterized by excess supply of money, since we need to decrease the interest rate or increase income to obtain the equilibrium in the money market. Therefore, e.g. the couple (100, 1100) is characterized by both excess demand for money and excess supply of goods, since it is below the LM curve and to the right of the IS curve. There is no adjustment process, since the economy directly jumps to the equilibrium point E. However, in general (that is, when AD depends on the interest rate), the adjustment process would be as follows: the economy jumps immediately on the LM curve, so as to restore the equilibrium in the money market, at the initial level of income but with an higher interest rate. Then, slowly, the economy will move along the LM curve, with an higher interest rate that depresses aggregate demand, thereby reducing it, and eventually the economy will reach the equilibrium E.
LM : i = Y − 880 ⇒ E′ = (180, 1060) . 4. An expansionary monetary policy shifts the LM curve to the right. This induces a decrease in the interest rate. However, since the IS curve is vertical, income remains at its previous level. 1Notice that equilibrium in the goods market requires: Y = AD (Y, i). Thus, any chance in Y affects both supply and demand, but the former more than the latter. 2. Compute the required change in real money supply ∆Ls to reach the external equilibrium E = (i, Y ). 3. What is the amount of capital inflows CF that occurs at the external equilibrium E? 4. Start from the external equilibrium E and suppose that the economy moves to a flexible exchange regime. What happens to the nominal exchange rate following an increase in the international interest rate to i∗new = 15%? ⇒ Ei = (2.86%, 2028.57) . ⇒ E = (10%, 2000) . 2For instance, this corresponds to a situation in which the economy imposes strong capital controls. This is an example of the trilemma, known in the international economics literature as the impossibility of achieving simultaneously all of the following goals: (i) control of domestic monetary policy, (ii) control of the exchange rate, and (iii) freedom of capital mobility. In our example, the central bank is renouncing to goal (iii). 3Think about the opposite situation: ii > i∗. Would foreign exchange reserves be a constraint for the central bank? Is there, in fact, an asymmetry? which delivers ∆Ls = 380− 400 = −20. That is, the central bank must reduce the money supply by 20 units, in real terms, which also corresponds to 400 units in nominal terms. 3. The balance of payments identity requires that the current account (which is the trade balance) and the capital inflows sums to zero, i.e. BP = CA+ CF = 0. CF = −CA = −20. Remember that a positive current account corresponds to an excess of domestic savings over investment, CA = S − I. That is, the economy is moving its saving abroad, i.e. it is exporting capitals, and indeed the level of capital inflows is negative4. ⇒ E′ = (15%, 2050) . e = R PP∗ = 2.17. 4Does capital flow to developing countries? This is a long-standing puzzle in international economics. Indeed, developing countries are thought to have a higher return on capital, since it is relatively scarce. However, capital does not flow to them, quite the opposite. 1. Find the equilibrium E = (i, Y ) of the economy. 2. Suppose the economy is considering to enter in a fixed exchange rate regime. What is the level of the nominal exchange rate that allows the equilibrium in the balance of payments? (b) the economy suddenly devalues its currency by 10%, thereby keeping it fixed. ⇒ E = (0.1, 4000) . which means that the economy is a net importer, i.e. the economy is receiving a net inflow of foreign capitals. i = i∗ + E [ė] = 20%. ⇒ E′ = (0.2, 3′966.67) . while the level of the money supply can be found from the LM curve, by imposing the equilibrium values for Y and i, i.e. e0. Then, the expected percentage depreciation is equal to: E [ė] = (e′ − e0) /e0, where e′ = αe1 + (1− α) e0. where t = 0.25 is the tax rate and the other variables are defined as usual. The domestic price level is P = 8, the international price level is P ∗ = 4 and the international interest rate is i∗ = 0.1. Answer to the following question. 1. Find the equilibrium and the associated nominal exchange rate. 2. Suppose that international investors hold the expectation of an appreciation of 2.5% of the domestic currency. What happens to the equilibrium? ⇒ E = (0.1, 4′000) . which gives R = 2.5 and in turn e = RP/P ∗ = 5 when evaluated at the equilibrium values in E.
i′ = i∗ + E [ė] = 7.5%. which is characterized by a lower level of income, despite the lower interest rate. That is, the decrease in net export (induced by the currency appreciation) must have been greater than the increase in investment (induced by the lower interest rate). Solving for the exchange rate, using the IS curve, obtain R′ = 2.47 and in turn e′ = 4.94.